How to Apply NEW Nail Wraps! I’m obsessed with nail art these days and LOVE following the incredible work of nail artists on social media! However, for those of us that don’t have the tools or the talent, I absolutely love the brilliant invention of nail wraps (stickers!!!). 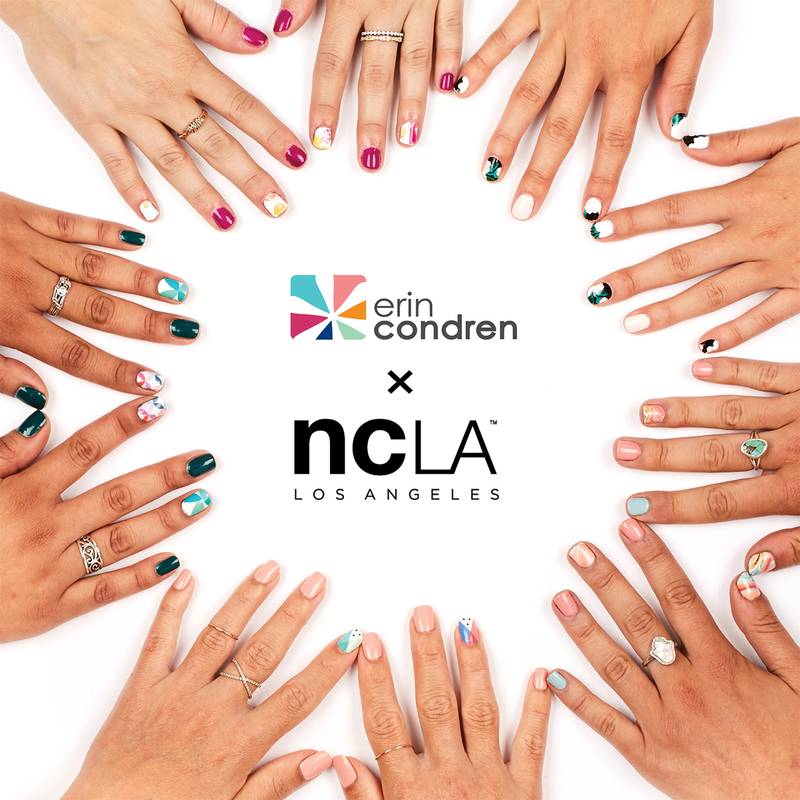 We’ve partnered with NCLA who has some amazing collaborations with Beyoncé & Hello Kitty, so, I was incredibly honored to be collaborating with them for my first collection of wraps! The application process is really meant for DIY-ers and takes some practice to make perfect! 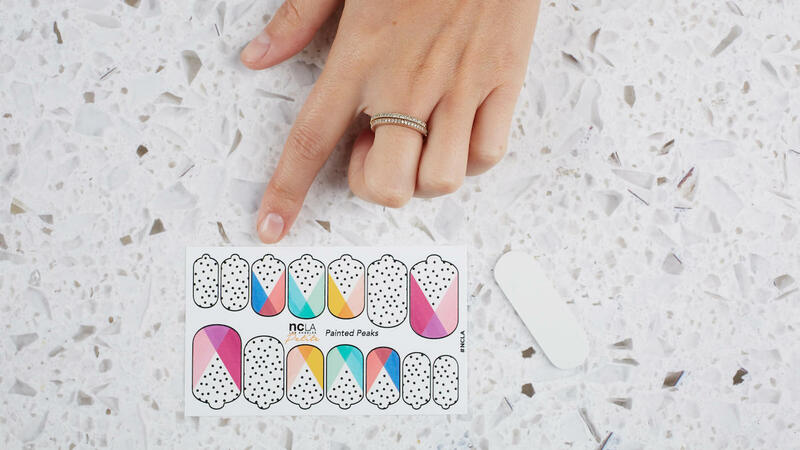 Nail wraps in your favorite design – mini nail file included! 1. 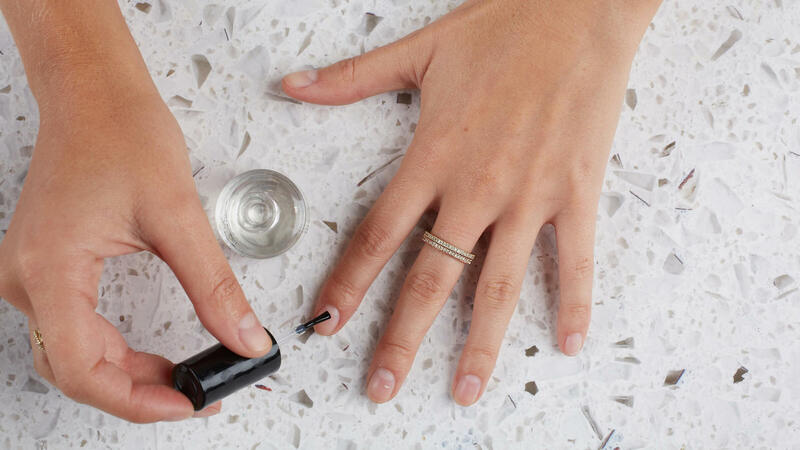 First, clean and file your nails as you normally would before applying polish. Any nail shape will work, however, I recommend keeping them square to make the design really pop and to eliminate how much you need to trim them to fit! 2. 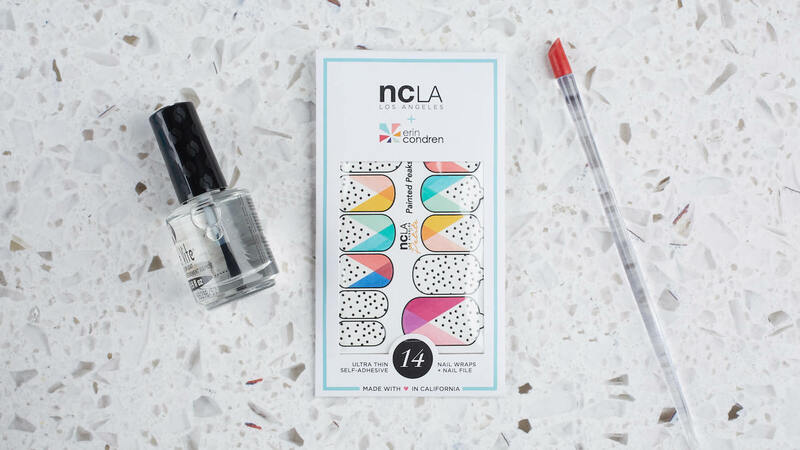 Apply a clear base coat (NCLA has a great option, but any clear base coat will work!) onto clean, dry nails, and LET DRY. I can’t stress this part enough- without a fully dry base, the stickers may slide and won’t adhere properly. 3. 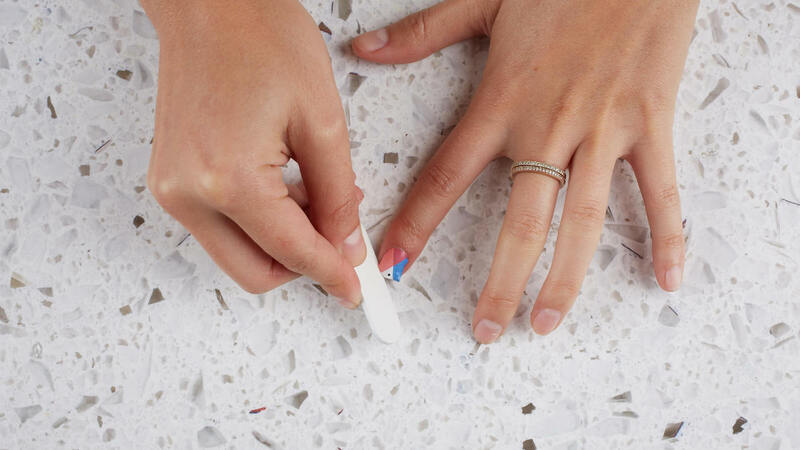 Depending on the width of your nail beds, you may need to trim your nail wraps (don’t worry about the length, we’ll get to that in a moment). Should you need a trim, simply measure the excess against your nails and use cuticle scissors to cut them to size. 4. 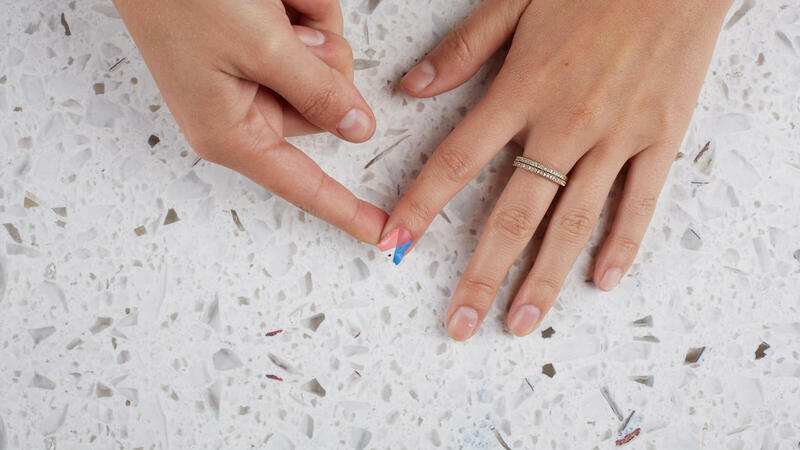 Next, apply the round side of the nail wrap against the cuticle. Stretch from the bottom upward and outward until you have the perfect fit! 5. Air bubbles? Don’t stress! Press firmly from the cuticle in an upward motion until the wrap is completely flat. 6. Lastly, use a nail file to remove any excess by filing in a downward motion. Apply a coat of clear polish for a flawless finish! Ready to ‘nail it’ with nail wraps? Shop all five designs here! *Don’t worry if you forget these instructions when you get the wraps. They come with a full set of easy to follow instructions as well. 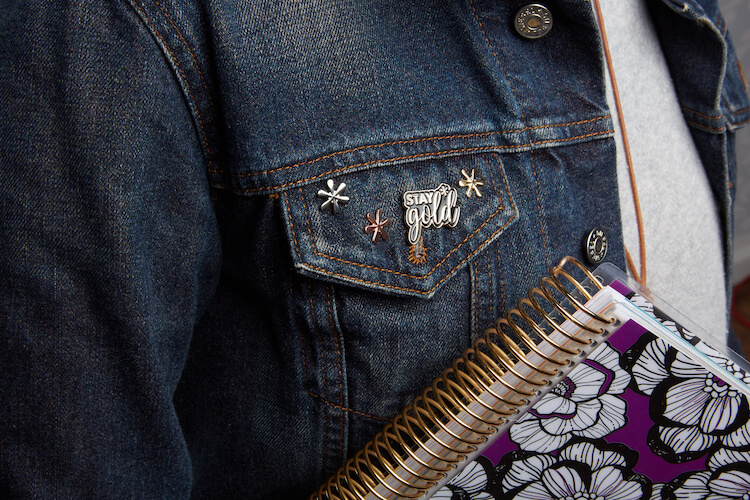 Dare to flair with NEW metallic pins! When I walked into my kids’ high school registration, I felt like I’d stepped back in time to the 80’s with all the buttons and fashion pins! 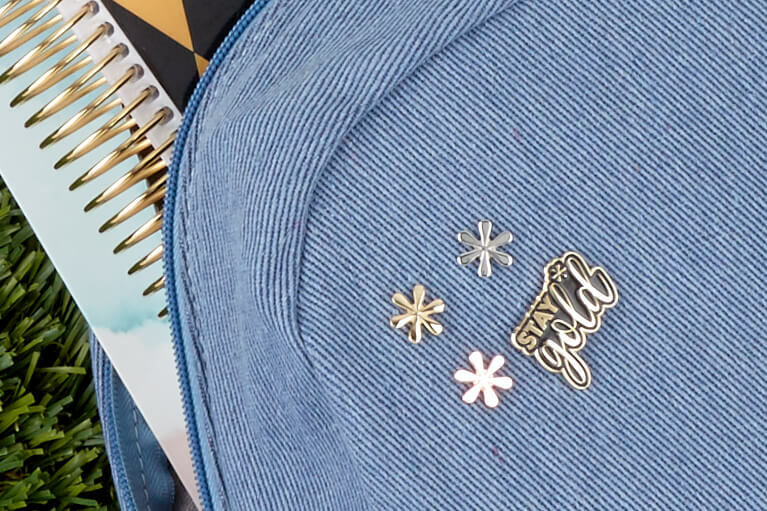 The fabulous flair pins I used to decorate my denim jacket in high school have made a HUGE COMEBACK, we had so much fun recreating the look in our signature style. Available in multiple metallics and two super-cute designs, adding flair to your favorite bag or jacket will earn you serious style points! (Pun intended). #Pinning Pockets Long hair can sometimes conceal your pins, so as an alternative, you may want to let them live on your lapel. Front and center, these beauties make a serious statement! Collar Candy Turn up the toughness by adding a little flair to your collar! Just a few pins placed around your neckline turn a normal jacket into edgy outerwear. Bag Bling Jazz up a backpack, tote bag, or carry-all clutch by adding a few strategically placed pins! Arrange them in an order for a patterned, put-together effect. or stick them at random for a funky, fresh look. When it comes to DIY projects, one fact seems to always hold true: the cutest crafts are usually the simplest! Even if you aren’t the world’s best baker, these custom cake toppers will bring a heartwarming, homemade touch to even the most basic of boxed brownies. The best part? They are stunningly simple to make – and the options are almost endless! Depending on your party theme or the occasion, we’ve got a TON of sticker books with the sweetest stickers to choose from! Whichever you choose, you will need duplicate stickers to wrap both sides of your wooden sticks, so keep that in mind. Most of our books come with duplicate stickers or at least duplicate shapes for easy attachment. Next, simply peel your sticker, attach it to one side of your stick (we used toothpicks for cupcakes and dowels for the cake) and carefully adhere the duplicate sticker to the back, securing the stick in place. Voila! 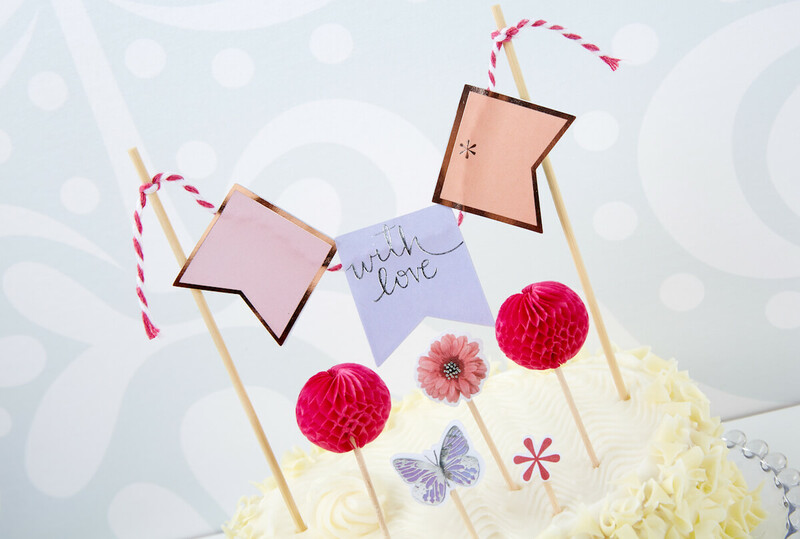 To take your cake decorating to the next level, you can even try fastening a banner using two sticks and a piece of string! 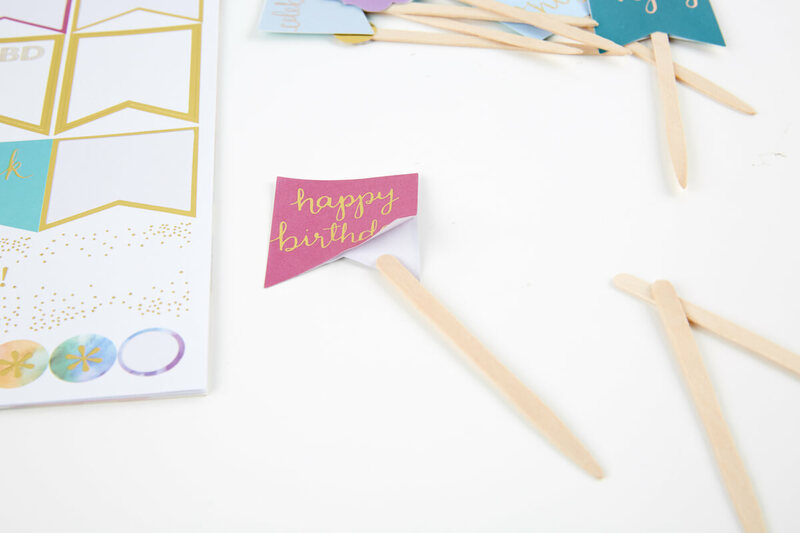 Simply decide on your banner length, tie a section of string to two sticks, and attach the “flags” in the same manner you used to attach the stickers to your sticks. 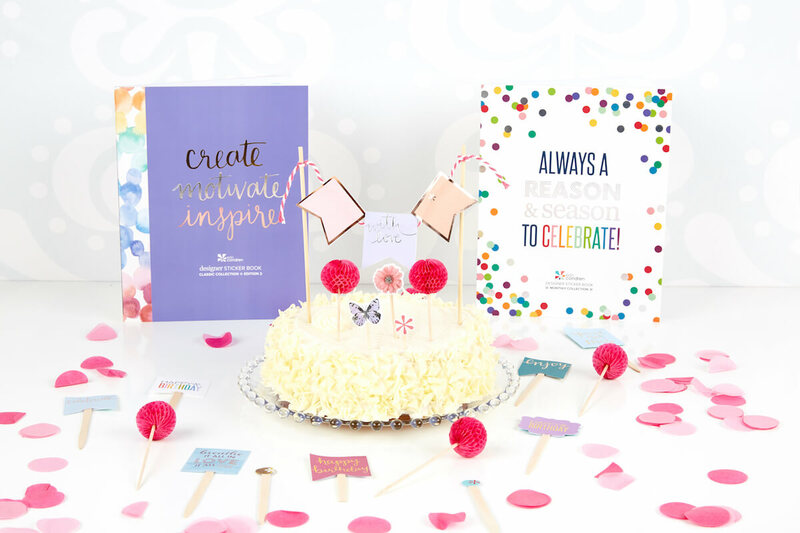 For this girly themed celebration, we used our designer sticker book edition 2 with metallic accents for the flags, and our monthly sticker book butterflies and flowers for extra decorations. Pretty genius, right? No time for baking in your busy schedule? We won’t spill your secret! 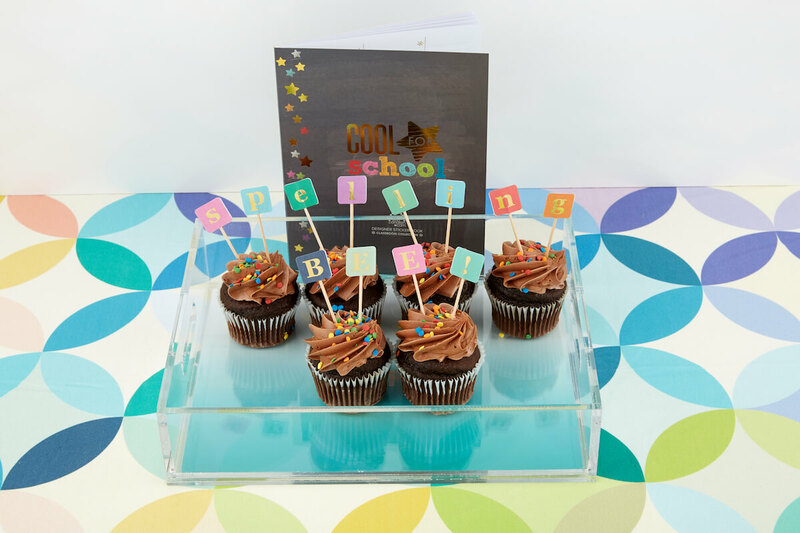 Grab some cupcakes from your local grocery and spell out something sweet with letters from our Cool for School sticker book. Stickers are a steal right now! Shop any LifePlanner™ or Teacher’s Lesson Planner, get a free classic sticker book on us. It’s probably no surprise to y’all that I am a very visual person… so when it comes to seeing my schedule, I am a sucker for stickers! Without the array of asterisks, colorful flags, and motivational quotes, it would be much tougher for me to make sense of my days- and a whole lot less fun! We know our fans are just as stoked for stickers, which is why we’re constantly developing new books and sheets so that your personality can shine through your sticker design! There is no “right” or “wrong” way to use our stickers – I encourage you to find the system that suits you! However, if you need some ideas and inspiration, we’ve put together two short videos featuring our monthly and classic edition 2 books to walk you through all the ways you can sticker your way to success! I’ve also outlined the different ways I use some of our sticker styles below. Flags: I attend a LOT of weekly meetings, so the brightly colored and uniquely cut flags are a regular lifesaver. The metallic accents make them pop against the page, they’re the perfect size to write on, and I love that I can color coordinate them so I never get confused on which meeting is which! Asterisks: Aside from being adorable, I use these stickers to mark appointments and errands! We cut them in many different ways to fit all areas of your weekly and monthly spreads. 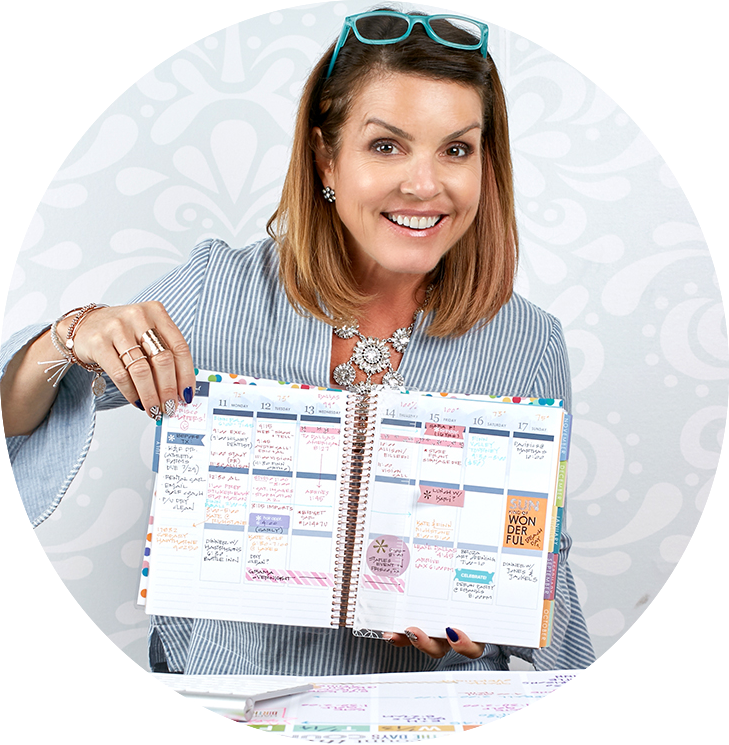 Quotes: Perhaps my proudest sticker accomplishment, the stunning metallic quotes are cut to fit the daily boxes of your weekly LifePlanner™ layout, giving you a a weekly dose of motivation or inspiration! Borders: I’m a total weekend warrior, so I love to anticipate a fabulous weekend of fun by bordering my Friday-Sunday stretches with the metallic border stickers! Cut them to the size you need, or use them to fill the margin above your monthly spread header- they are just the right dimensions! Sheets: The most versatile of all our sticker collections, designer sheets are a do-it-all dynamo when it comes to organizing your LifePlanner™! These sheets can be cut to make all sorts of stickers (more info on that here) and look absolutely lovely in the margins of a neutral planner to add pops of color! Sticker heaven is waiting…buy any sticker book and receive our first classic edition FREE! 3 Reasons You NEED Neon! They say trends come full circle, and after working in a creative environment for the last ten years, I’ve come to realize it’s totally true- and in the case of neon, totally AWESOME! How can you not be drawn to the energy of these bright, brilliant hues? I’ll leave my big hair and headbands in the eighties, but neon is never going out of style! 1. Blossom and ikat were the perfect picks for the neon prints- against bold backgrounds, it makes for a fun twist on classic designs! The repeating patterns contrast against the lunar blue, lift off lemon, outrageous orchid, and plasma pink colorways are enough to get anyone’s pulse racing! 2. When we set out to design this collection, it was extra-important to me that we do justice to the vivid colors that set neon apart from its sister shades. That’s why we selected specially dyed paper to pump up the palette as much as possible! Furthermore, to make our patterns pop, we needed a special white ink to create contrast. This is not something that’s easy to find in the printing world – but we really wanted to nail it with neon, so that’s exactly what we did! 3. It’s amazing to see just how beautiful these designs are in person, especially when you mix and match them. We were so struck by how lovely they look, we knew we couldn’t stop at just books. Keep your eyes and ears open for matching neon elastic bands coming soon.. how radical is THAT?! Need a closer look at neon? Shop the full collection here!